We want to share some information about an upcoming product release from Yu-Gi-Oh! TRADING CARD GAME: Launching Friday, June 14, Dark Neostorm gets a second wind with the Dark Neostorm Special Edition. 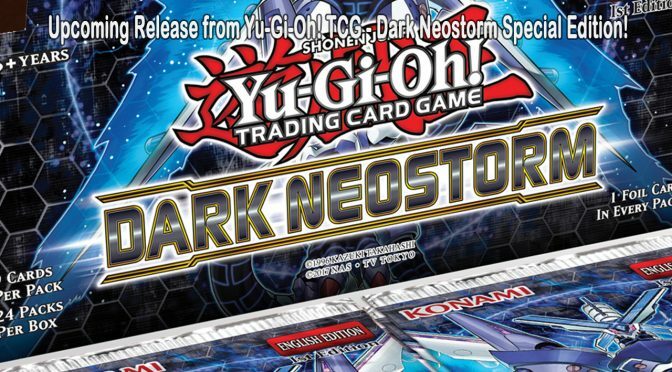 Each box of Dark Neostorm Special Edition (DANE SE) includes 3 booster packs of Dark Neostorm, along with 1 of 2 Super Rare variant cards as well as 1 of 2 Super Rare variant preview cards from the upcoming Summer 2019 booster set. Dark Neostorm also follows up from October’s Legendary Hero Decks by introducing brand-new cards for Destiny HERO Decks including a new Fusion Monster that can rearrange the top cards of either player’s Deck – perfect for putting powerful Normal Spells on top of your Deck for Destiny HERO – Diamond Dude to find..
Each box of Dark Neostorm Special Edition includes 3 booster packs of Dark Neostorm, along with 1 of 2 Super Rare variant cards as well as 1 of 2 Super Rare variant preview cards from the upcoming Summer 2019 booster set! Each of the core booster sets this past season highlighted one of the main Special Summoning mechanics from previous eras of the game, and in Dark Neostorm it’s Xyz Summoning’s turn to shine!